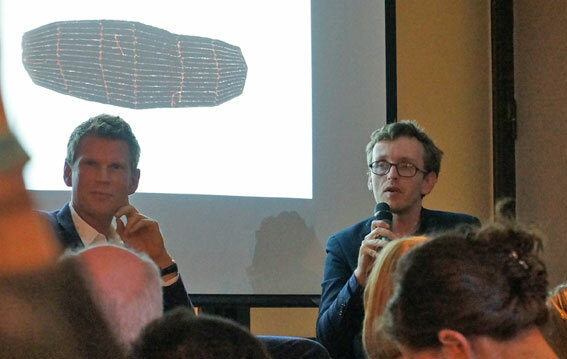 Erwan Bouroullec was in conversation with Icon editor Chris Turner at Vitra showroom during the Clerkenwell Design week. The younger half of the Bouroullec brothers gave an inspirational talk with good sense of humour and sympathetic character about their unique and very successful design approach and their latest work for Vitra the Workbay Office. Erwan Bouroullec started by talking about their approach of how not knowing too much when you start designing is important. Knowledge might make you being afraid of the consequences, and avoiding risk taking which can be limiting to new ideas. His view about the office design is that it should include more elements to make the space feel more private. He mentioned a few times that well-balanced space is the most important goal. The space design should be 50/50 open – closed. The furniture should be multi-purpose and flexible, since people are evolved from animals – we need to have movement. Movement is a natural state for humans. He calls this micro-architecture; self-standing structures to organise the space. It is about generosity and flexibility. It’s about Do-it-yourself design. Erwan reveals his childhood dream was to be a pop star. Their design team is like a band. They want to re-invent and DIY products using hammer and nails. They prefer to employ people when they are still at school, since knowing too much is a burden. They like to know that they could produce themselves things they create, not relying too much on technology. He likes going back to the basics, e.g. stitching techniques, using tradition and culture to bring beauty to products. They work by generating landscapes in the workshop, hybrid shapes and mock-ups with messy drawings. According to Bouroullec nobody is professional, they are all self-taught. He says today they do more to do less. Doing less becomes a meditative process, by re-drawing to make unnecessary to disappear. They use floors and walls at the workshop. “We make it like a game”. The studio is very good at 3D modelling. “We discover by making errors”. Bouroullec says he is involved in about 20 projects simultaneously. The scale varies from 3 months to 6-8 years. This is their prefered way of working, where ideas from different projects feed each other, scales get mixed and errors reveal discoveries. His goal of design is ending it to a reality, and selling the product. Erwan Bouroullec has a fine art background. He was asked what he thinks is the difference between art and design? Firstly Bouroullec answered that in his opinion there is no real difference between art and design. Fine art is about revolution, extreme changes, not explained to the audience by the artist. Design is more gentle, explained. In design the control elements becomes very important. He reveals being concerned about this aspect and because by trying to control too much can limit creativity. Finally Bouroullec was asked about throw-away furniture and he mentioned that cheaper furniture should be better by being honest and transparent about how to make it cheap. For future directions about design he commented that we are loosing understanding of what is real, when real and fake are blurring more and more. This is not good for design.